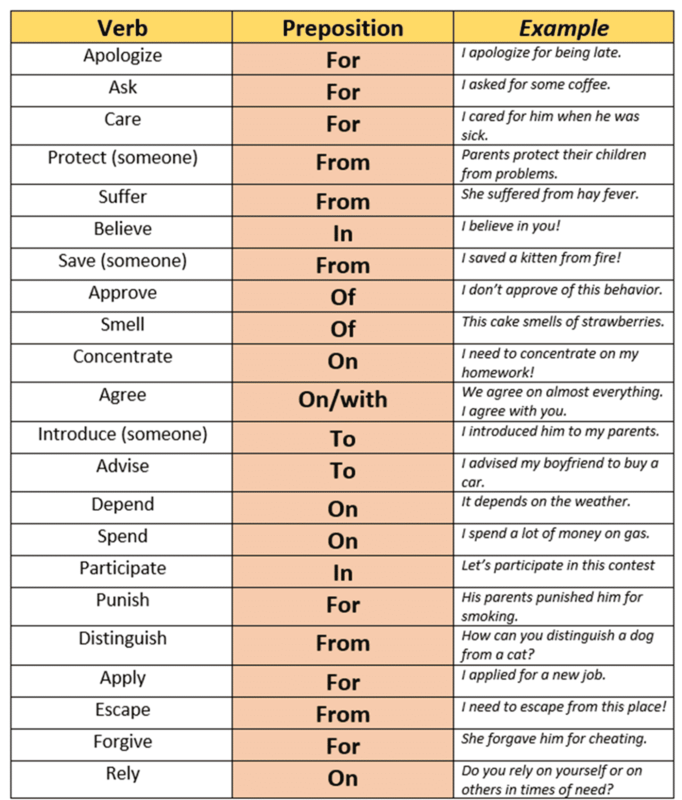 Verbs Followed by Prepositions – Some verbs are usually followed by prepositions before the object of the verb. E.g. His mother accused him of eating the entire cake. E.g. Matt does not agreewith my answer. E.g. Jackson apologized for his rude behavior. E.g. I want to applogize for my mistakes. E.g. John believes in oat bran. E.g. I blame Janet for the broken pottery. E.g. Can I borrow a hammer from you? E.g. He doesn’t care for playing golf. E.g. You are always complaining about me. E.g. Let’s compare the virtues of savings accounts with investing in bonds. E.g. We depend on our customers’ suggestions. E.g. Mark dreams about becoming a ballet dancer. E.g. The boss implicated Peter in the crime. E.g. She invited herself to this affair. E.g. The students are protesting against the invasion. E.g. Peter reminded me of Tom. E.g. Detectives carried out a thorough search of the building. E.g. Who’staking care of the children while you’re away? E.g. If you subtract 6 from 9, you get 3.